Unlike cities in which art is stored in museums and daily life happens on the streets, Naples's distinctive mark is its folclore: people living and working among the artistic beauties of the city. Tourism has become a key factor in the city's economy. These pages of our website aim to provide a series of useful or even essential information to help you get to know the city. 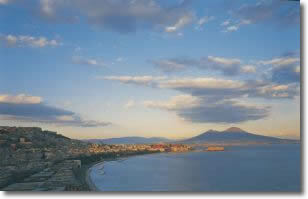 So, welcome to Naples! We wish you have a good stay in this wonderful place and we hope you will take pleasant memories of your holiday back home.